They fit well, I haven't worn out yet, debating on keeping due to cost and maybe having another pair that will work, i have foot problems though and they seem to work with my feet and are very cute. Wanted to love these shoes, but the fit is way too small for me. Strange bc I wear a similar Naot sandal that fit perfectly. I leven tried the next size up and still too small. I do love the look. 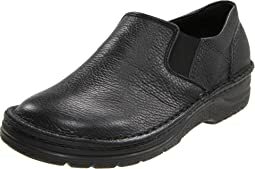 These have a very cushioned, soft foot bed, good arch support, and a great amount of room in the toe box, which I like since my feet are wide there. I liked the style fine. I generally wear an 8.5 and went with a 40 which may have been a little big for me - should have ordered a 39 as well to try. They did seem a little long but I thought I'd be wearing them in the heat and my feet might swell. In the end, I reluctantly returned because of how high the ankle part came up. It was a little loose around the ankle and I thought it would irritate me. Made me sad because I loved the comfort of the foot bed and toe. In general, I really love Naot! 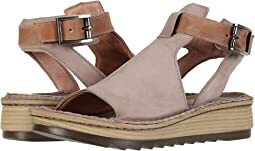 As a 60-year old woman with a history of bone breaks in ankles and feet, I find if difficult to find comfortable, supportive, reasonably stylish sandals. My forefoot has gotten a bit ”spready” with age, my big-toe joints are tender, and I can no longer tolerate a sandal that goes between my toes (flip flops and such). 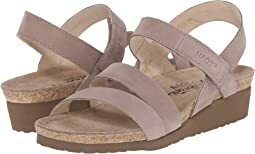 These Naot sandals are perfect for my needs! The straps across the forefoot are soft and well placed, so they don’t cause pain in my pinkie toe (or allow it to escape, which some sandals do). 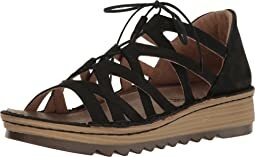 The straps are a bit loose (the sandal does not run wide but the straps do, which is odd), which might normally be a problem for me because my foot moves around on the footbed at bit, but the contoured footbed offers enough stabilizing support that that the shoe feels secure. 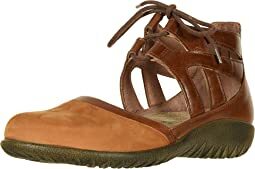 I would usually pass on any shoe where straps fastened with Velcro, but on these very casual shoes the Velcro makes sense. It also allows you to fully customize the closure strap, for a comfortable fit (and loosen the strap if your feet get puffy on a hot day). The Velcro is not too obvious. I am a US9 Medium and ordered a size 40 (I often take a 9 in other brands). The back of the shoe (heel cup) fits my heel perfectly, while the front is a smidge narrow. It’s not bad enough to be a problem, but ideally I would want maybe a quarter inch more room there. The footbed is just long enough for me. My (short) toes sit very close to the front edge and my feet scoot forward a little as I walk. So if you are between sizes or have long, wandering toes, I suggest ordering the next size up. Overall, I am very pleased with these. No break-in period needed. I bought the Navy Velvet because the color is less harsh against my pale feet than the black colorway would be. I think navy is a good neutral. The cork footbed feels cool and soft on your bare soles. 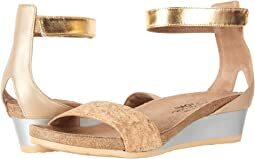 Cork is also anti microbial, which is great for sandals. Loved the sandal! Would have kept the 37 but the velcro on one of the shoes was not attached correctly and rubbed my foot. I will reorder when you have them in stock again. Great shoe! Very comfortable right out of the box. Looks good with jeans, dress slacks, or dresses. Really pretty shoe and it all fit well except for the heel strap that i couldn't fasten tight enough to stay on my heel. Regretfully I have to return the shoes. I bought these because I had such good fortune with another pair of Naot sandals, different style. These are so fun and scream sassy style, but unfortunately, the foot bed runs narrow. Perhaps my feet are changing.... I am 46 years old, and run 3x a week so I try not to wear heels for extended periods of time. I cannot wear these on a regular basis, like I could my flat Naot sandals. These might have been a keeper had it not been for the seams on side of sandals that I felt when I walked. Perhaps they were damaged, but they were the only one left in my size. Bummer! This is a beautiful color, and I was disappointed it didn't fit . 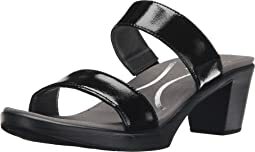 Its marketed as narrow to medium , but for me , it was too wide around toe area. They are very light, and I think they would have been comfortable had they been a bit narrower. Back they go. 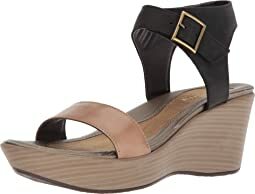 Zappos is the best especially for people like myself who have a hard time with shoes/sandals. 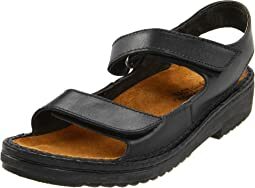 I purchased these men's sandals as I am a no-nonsense female with a moderately wide foot in the ball-of-foot area (thank you, bunions). 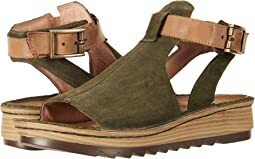 I love these sandals!!! I find that I long to put these on if I am wearing other comfy shoes/clogs. I'm finding that they make me stand up straighter. They took a week of wearing at home to really start to break in and mold to my feet, so I feared they were not going to be keepers. But, oh I'm keeping them! I wish Naot would really mean wide-width with some of their women's offerings, but i find those are still to narrow for me. Bought these for vacation in the Caribbean and they were perfect. Cute and match everything. Plus, they were more comfortable than many of my other sandals. Thumbs up! Beautiful sandal. I got the rose or pink colored one this time. I love all Naot's but this one is so very dressy, and I always like the bling. I love it that it is more narrow also. I always wear a 42 in Naot's and am so thankful that the size is always reliable. Naot's really help with the perfect arch support for me to wear with no pain. 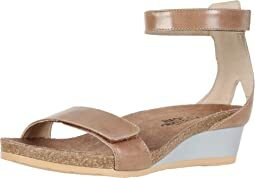 I just know that I will be sticking with these Naot shoes, and am sooo thankful for Zappos. I love Naots and own several pairs. These just....looked odd (the weird sandwich layers) and the bottom felt completely inflexible. Very atypical of Naots. It’s a beautiful shoe and fits true to size. I didn’t like the feel of the ankle part. It felt too high up the back of my ankle and uncomfortable to me. This shoe was just uncomfortable generally for me. I am a big Naot fan and have several pair. The tie was uncomfortable, the foot bed was narrower than my other Naot sandals. Pretty color and nicely made shoe, just not good for me. Love Naot brand and usually buy this brand exclusively - one negative is that they stretch out and become loose in a short time. Sooooo comfy! The fit is perfect! Look cute with wide linen pants for summer. Not cheap but you get what you pay for as they say. 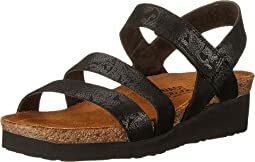 These sandals are very comfortable and supportive and the style looks good even on my wide foot. However, the adjustable strap only fits with a half inch of velcro showing, which is not attractive and is annoying on a shoe that's supposed to be wide. I like them pretty well otherwise, but I'd love them if that strap were longer. I'm happy Naot is offering some styles in wide, but I'd be happier if they made them truly wide. What happened to the quality of Naot shoes?! These were maybe 70% lighter than my previous pairs (similar styles) and much flimsier. At nearly $200 per pair, very disappointing. I bought a pair of Naot Karenna sandals so many years ago I was surprised they still made the same style. Dragging out my old faithful Karennas they were looking pretty sad from years of use (the velcro was starting to get slick). Bravely I discarded my old friend and ordered brand new ones. 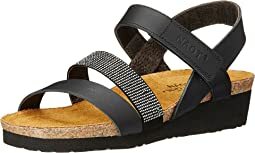 I have many other Naot sandals but the Karenna sandals are my everyday go to sandals for comfort and definitely the durability. I highly recommend them. This is a nice slip on sandal. Both straps Velcro for adjusting, Naot’s are the best for my feet, just the right amount of support. 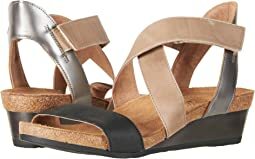 This sandal Just has two straps, so the top does not support the foot as much as other Naot sandals, but they are super comfortable.